↑ I did not want to destroy the Bamiyan Buddha. 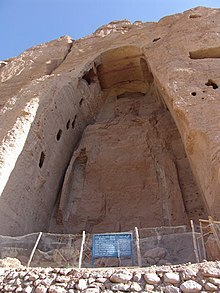 In fact, some foreigners came to me and said they would like to conduct the repair work of the Bamiyan Buddha that had been slightly damaged due to rains. This shocked me. I thought, these callous people have no regard for thousands of living human beings -- the Afghans who are dying of hunger, but they are so concerned about non-living objects like the Buddha. This was extremely deplorable. That is why I ordered its destruction. Had they come for humanitarian work, I would have never ordered the Buddha's destruction. ↑ this work of destruction is not as simple as people might think. You can't knock down the statues by shelling as both are carved into a cliff; they are firmly attached to the mountain. ↑ Muslims should be proud of smashing idols. It has given praise to Allah that we have destroyed them. ↑ "...crime against culture. It is abominable to witness the cold and calculated destruction of cultural properties which were the heritage of the Afghan people, and, indeed, of the whole of humanity." ↑ Asian Art, chap. "History of attacks on the Buddhas"
↑ "Taliban destroy ancient Buddhist relics – International pleas ignored by Afghanistan's Islamic fundamentalist leaders"
↑ Falser, Michael. "The Bamiyan Buddhas, performative iconoclasm and the 'image' of heritage". In: Giometti, Simone; Tomaszewski, Andrzej (eds. ): The Image of Heritage. Changing Perception, Permanent Responsibilities. Proceedings of the International Conference of the ICOMOS International Scientific Committee for the Theory and the Philosophy of Conservation and Restoration. 6–8 March 2009 Florence, Italy. Firenze 2011: 157-169. ↑ U.N. Confirms Destruction of Afghan Buddhas, 12 March 2001, ABC News. "Japanese researchers make breakthrough on destroyed Bamyan paintings"[স্থায়ীভাবে অকার্যকর সংযোগ]. Mainichi Shimbun, Japan, 2004-12-11. Historic footage of Bamiyan statues. C. 1973. youtube. Dupree, Nancy Hatch. The Valley of Bamiyan. 2nd ed. Kabul: Afghan Tourist Organization, 1967.